Where are you from? : From France ! Which Tolkien-related works have you read, seen or listened to? : Movies (Lord Of The Rings trilogy many times, The Hobbit also), books (Lord of the rings, The Hobbit, Unfinished Tales of Númenor and Middle-earth, The Childrens of Hurin, History Of Middle-Earth). Are there any styles that you excel at? Any styles which you have difficulty with? : I can buil anything. I learn faster. Other relevant skills: Substance Painter, Substance Designer, Photshop, Illustrator, Unity, Maya, History. Hey there, nice app! I think you don’t have the AC overlay working correctly, cause the ivory block should look different, so try to fix that. Also, if you’ll need to upload other pictures for your application in the future, don’t use shaders, cause it makes pictures less clear. Anyway, your Lórien house shows you put a good effort to understand the style, there’s a couple of things that can be improved tho. Since these elves have a very simple lifestyle, don’t use any kind wardrobe, cupboards or bokshelf. You can fill up the space in other ways, but don’t be afraid to leave some empty space. Also try to figure out a more specific purpose to your build, right now the profession is not so clear. 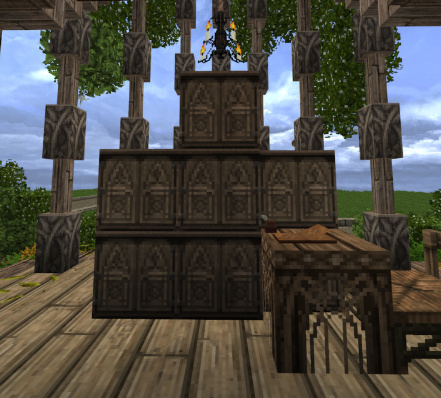 (Remember that in Lorien workshops are separated from living houses). With the red line I have highlighted some parts of this facade that look way too blocky and squared. You can try to have a more flowing line, using arches of different height. This part of the roof outline doesn’t look too good. I think the main problem is that you are trying to have a 3 blocks overhang with just 3 blocks of height gain, so it’s hard to have a flowing line. What you can do is reducing the overhang or increase the height. I hope you’ll find this useful, forgive me if some things I wrote are not so clear, it’s not easy to expain this kind of things. Try to work on these points and I’m sure it’ll look better, Lorien style is very demanding. Is not that he working badly but just I don’t have the AC Overlay (i saw it when you said to me), I have to download it, sorry ! I will change some block later ! About the differents style, when I asked on discord some recommendation, Fornad said to me that I had to show I knew how to build. So, I take both styles and I began to built with my imagination. I know that is not the perfect style or something but I wanted to show my construction skills and ambience I could bring on. Sorry for shader, I’ll change that in the future ! Sorry for my english, I’ll learn more and more ! And thank you for your recommendations ! 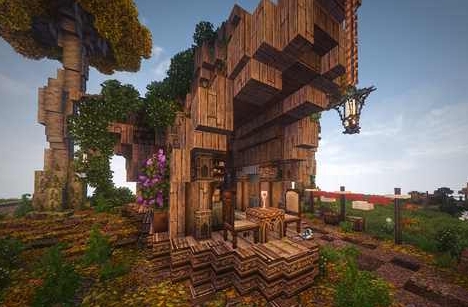 Ok to take this forward could you try and improve your Lorien house according to the feedback and try building an Eastemnet Ger with a cart and horse posts. You can find inspiration for this at /warp EEC1. Once you’ve done these things please post an album of non shader screenshots with good views of the builds as a new reply on this thread. On the whole pretty good. The ger’s roof isn’t shaped too well but that’s not a big problem. 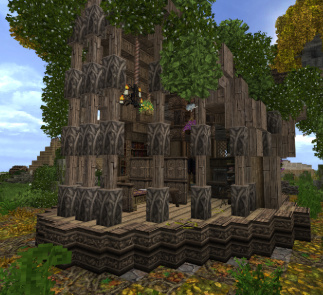 Your Lorien house also has some weird designs shown in the pics below. Try not to put pillar blocks next to each other like in the middle picture and don’t spam a weird design like you’ve done on the first pic. Finally don’t use furniture like you have in the 3rd pic where you’ve stacked it all together. We have so many blocks so try to vary it up a bit and come up with a nicer design that utilises more than just one or two blocks. When you build a house in a project and think it is finished, you should post a comment on this application thread with the closest warp and coordinates of your house. Then Builders or Overseers will comment on this thread and give you fair feedback. 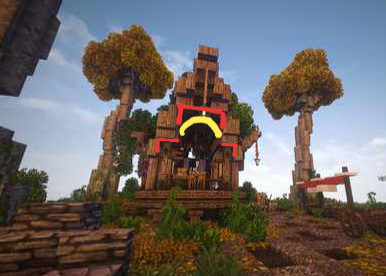 When you have achieved a standard of building that matches the basic standard of the server, you will be promoted to Builder. This could be on your first build or one further down the line. 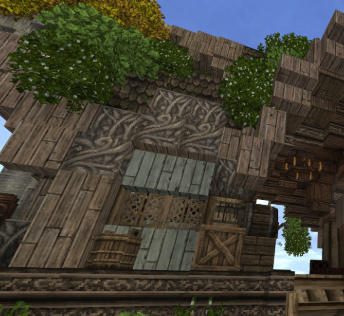 ArdaCraft is a friendly community that explores the freedom to create and build together. However, when we are dealing with an enormous project like this there are some guidelines we need to follow to make it work. Firstly, always name the stuff you build. We have a set of project blocks that we use - you can read about those in the new player guide at ‘/warp spawn’. Secondly, if you are looking for something to help out with, you can type ‘/warp jobs’. This is where you can find all open jobs like building houses or something similar. You will be provided with instructions on how to get to these projects, and what to build once you get there. Thirdly, do not be afraid to ask members for help and get to know us. This is a community project and it’s important to be part of the community! Stay active on Discord and the forums. Make sure to let Fornad know who you are on Discord so that he can give you the appropriate rank on there.